ESPproMon Project Updates - Site Feedback - ESPproMon Smart Meter and Home Automation Community. Google Nest, British Gas Hive and Apple HomeKit on a budget. It has now been more than 12 months since we released the ESPproMon firmware. The project now operates as a Blynk project rather than a standalone app. 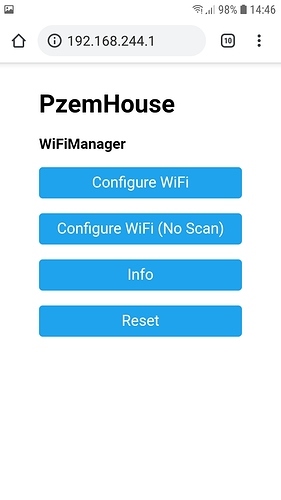 Skip to ESPproMon Project Updates for WiFi Manager configuration details for the project. Dear @Costas take your decisions and let us know. As you know I am one of your clients. a few days ago the application stopped to work as you told us. What is the next step? At this time there are no plans to support the ESPproMon firmware. Could you to provide source code on the arduino plataform for who bought the firmware? This is a very bad announcement for all of us that are your customers and we have paid your software. 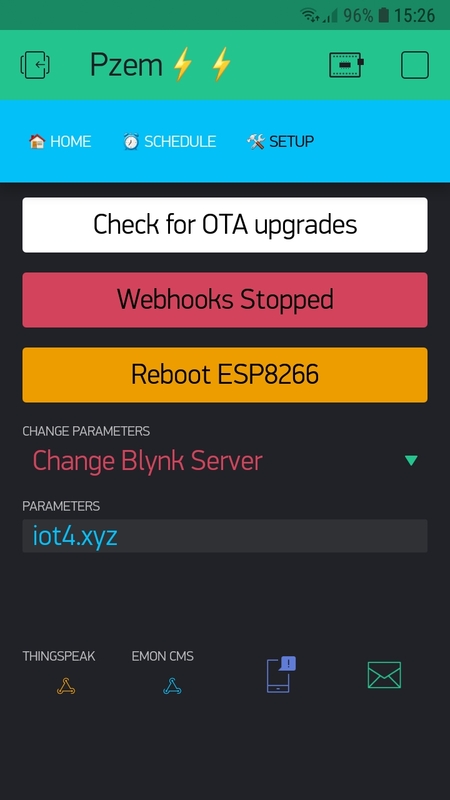 At least, as a good sign from you, release the Arduino sketch to us in order to make it in Blynk cloud. Anyone that is not happy can apply for a refund but the source code will not be made available. Ok how can I apply for refund? I am interested in as a fair solution. It’s a pity your APP is down right now… I wish you good luck for your future projects!! Hi, Sad to hear, but thanks for the support and help in the past days. I used app for reasonable time. I know that the power factot is something that we can calculate, so what is the formula to do this calculation? Power factor is included within the library provided by olehs, you don’t need to calculate it. I use this library but I found only Voltage, Current, Power and Energy. What function is for Power Factor? Many thanks @Costas. I did already "outside"the library, as you can see, it is just a simple calculation. ESPproMon is now available as a Blynk project rather than a standalone app. 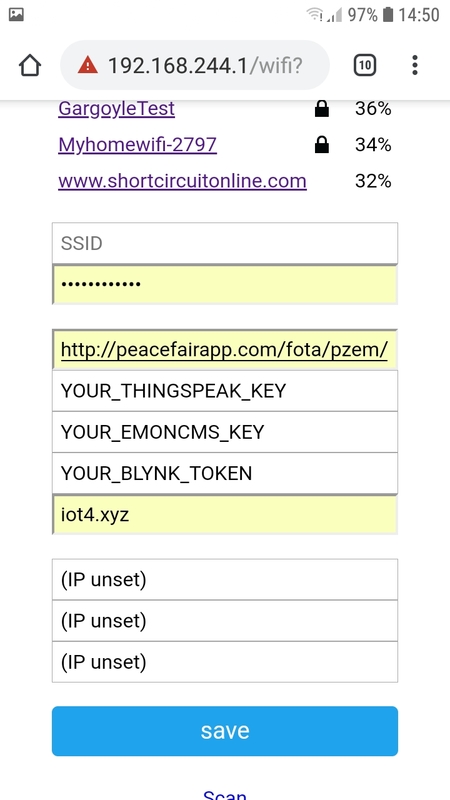 At this present time it simply displays the data from the Pzem on your smartphone and saves the data to Thingspeak and EmonCMS. 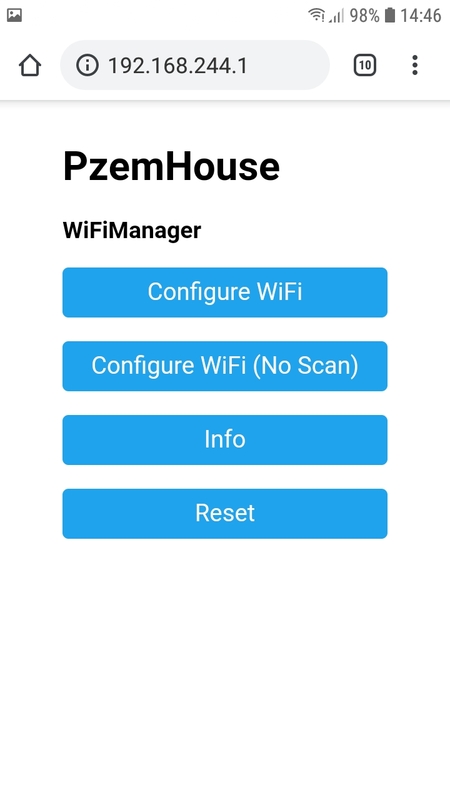 Once you have flashed your ESP8266 it will create an access point for your phone or PC to connect to. 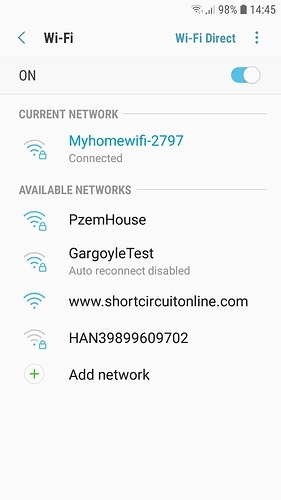 Access point is called PzemHouse with a password of p4ssword. 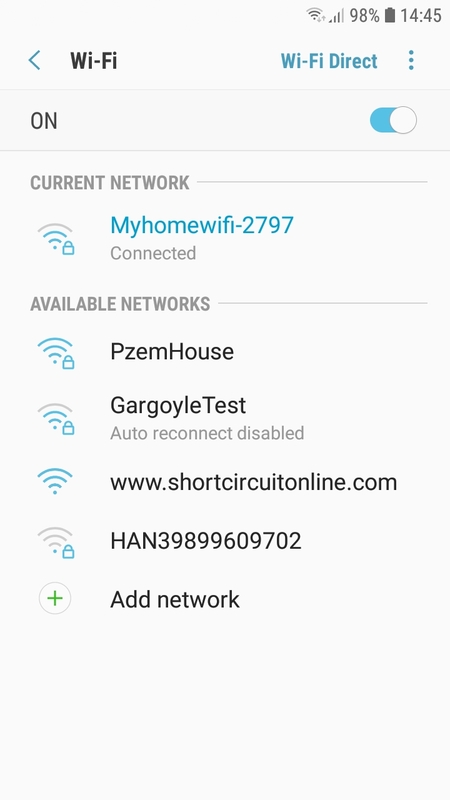 Once you have selected the access point you need to go to 192.168.244.1 in a browser. The URL for OTA updates and the blynk server address that you need to enter are shown in the screenshot below. 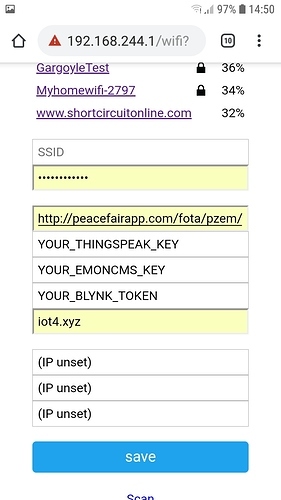 Please note there are two different URL’s for OTA updates as covered in the setup instructions at https://peacefairapp.com/#!/setup. 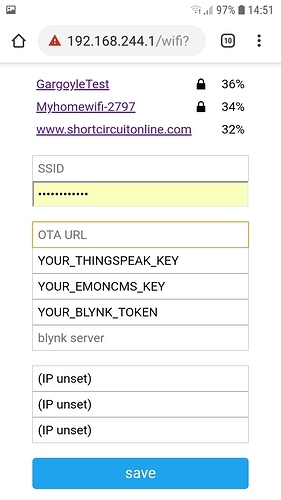 Obtain your Blynk token from the project in Blynk and you can enter a single space for each of the Thingspeak and EmonCMS keys if you haven’t created accounts with Thingspeak or EmonCMS. You don’t need to enter anything for the (IP unset) fields. Once you save the details your project should be running. If you haven’t created accounts with Thingspeak or EmonCMS ensure you set “Webhooks Stopped” in the SETUP tab as shown below. Thingspeak is free for the volume of data we use but there is a cost of a few dollars per year for EmonCMS. Once you are ready to add your KEYS select the option from the CHANGE PARAMETERS drop down menu and enter the key value in the PARAMETERS text input box. You can then start up the data transmissions to Thingspeak or EmonCMS by clicking the red Webhooks Stopped button.